Sustainability is the standard. We accept it; we embrace it. 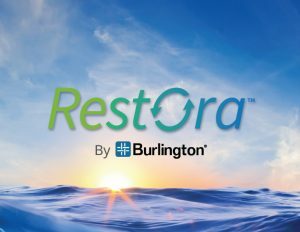 Burlington is excited to introduce its next evolution of sustainable fabrics called Restora™, a renewable fabric collection for the eco-conscious outdoor enthusiast. What goes around comes around and what was once new does not have to become waste. Create new meaning and purpose for plastic waste with Restora™. The Restora collection features eco-conscious fabrics made from a range of innovative and industry leading recycled content. New sustainability partners Eco Circle™ and Seaqual™ are added to long-standing sustainability partners REPREVE® and THREAD™ to offer customers a broad range of renewable materials. Eco Circle™ fibers powered by Teijin use a closed loop recycling system to give new life to old polyester based garments. Teijin’s revolutionary process separates and eliminates both additives and colorants and purifies the recycled polyester to its original quality and function. In an exciting move towards recycled marine plastics, Seaqual™ fibers are made from 100 percent post-consumer plastic bottles and plastic waste reclaimed from the Mediterranean Sea, creating yarns that contain about 93 to 95 percent recycled PET and 3 to 7 percent ocean plastics. For more information about Restora fabrics and Burlington’s commitment to sustainability and social responsibility visit us at burlingtonfabrics.com or see us at the Outdoor Retailer Summer Show, July 23 - 26, MR#204. Come explore our many performance fabric technologies and discover what our fabrics can do for you.